I finally had a chance to sit down this morning and sort through the pile of notes, menus, books, and magazines I brought back from my trip to Portland. There is a loaf of six-seed soda bread baking in the oven, a slab of butter on the counter waiting for it. I was thinking I'd share some highlights (and a couple photos) from the trip to Oregon, write up the soda bread recipe for you, then give the pot of left-over soup waiting on the back burner the signal that it's time for lunch. If you find yourself planning a trip to Portland, you can have a look at some of the places I visited the last time I was there. I revisited a few of those on this trip, and made it to a handful of new places as well. There are also lots of great suggestions from you all in the comments section. 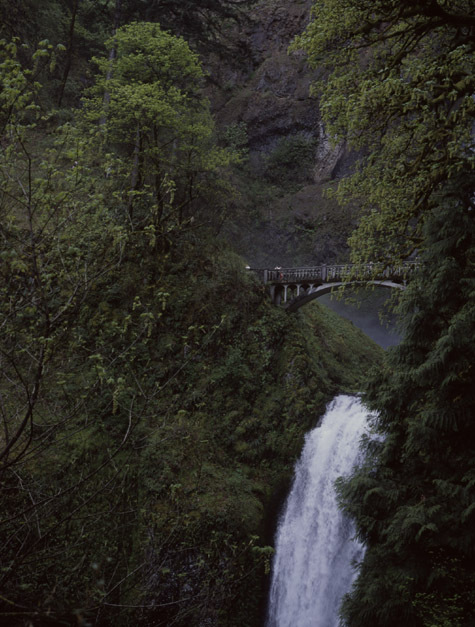 One of the highlights of the trip was getting outside Portland a bit. The area surrounding the city is beautiful, and we spent an entire day driving along two-lane back roads, pulling over to see waterfalls, gorges, bridges, small towns, and off-beat houses for sale. Here's a shot where Wayne surprised me while I was taking the previous picture. On the food front, I continue to love lunch at Clyde Common, and would go back there everyday if proximity permitted. They had a buttermilk-dressed wheat berry salad on the menu that stole my heart, and an Upright Brewing Co. Farmhouse Rye Ale on tap that stole my craving for any other beer that week. We popped over to the Little Red Bike Cafe early one morning - had fantastic coffee, a hearty breakfast, and a nice chat with Evan before heading out in the rain, and then went to stock up on an unreasonable amount of salt at The Meadow, again. Moxie Rx wasn't open during our stay, but Nancye (the owner) is an old friend of ours, and we were able to meet up with her for brunch the next day at Tasty & Sons. Also loved Navarre - their pearled farro, red celery, and parsley salad in particular. Another night we walked from the hotel downtown to Indish, and had one of the best, and most thoughtfully prepared Indian meals I've had in some time - bright, fresh, flavorful - really great. I packed my suitcase with a number of books and publications to bring home. I bought the new issue of MIX, a smartly-done magazine focusing on Portland's food and drink culture (here's a link to their subscribe page in case you're interested). I snagged a copy of Edible Portland, a copy of Reza Mahammad's Rice, Spice, and all Things Nice, and a copy of Hugh Fearnley-Whittingstall's River Cottage everyday. The soda bread recipe in Hugh Fearnley-Whittingstall's book jumped out at me the first time I flipped through the pages. I make soda bread quite often (my favorite is actually a rye version) - it comes together in no time, with a small handful of ingredients, and you can have a loaf in the oven in under ten minutes. With a few minor tweaks to his recipe, I've also been enjoying Hugh's seeded, whole-grain flour version over the past couple of weeks. 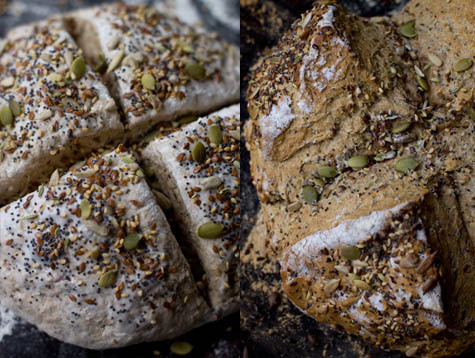 This soda bread is made with a blend of spelt flour and all-purpose flour, the dough is littered with seeds - sunflower seeds, pumpkin seeds, sesame seeds, poppy seeds, flax seeds, and fennel seeds. It takes on a nice crunchy crust, finished with more seeds on top. I like it in the morning slathered with bit of farmers cheese drizzled with honey, for lunch (like today) along with a bowl of soup, and leftovers make good croutons. If you're convinced you can't bake bread, I'd like to encourage you to give this a shot - at the very least you'll be out a bit of flour, some buttermilk, baking soda and some seeds. The upshot is you'll be able to make fresh bread any time you like. I've been enjoying this combination of seeds, but feel free to experiment with other combinations if you prefer, based on what you have on hand, or what is available in your area. You can also make this with whole-wheat flour in place of the spelt flour. Preheat your oven to 400F / 205C. Place a rack in the center of the oven. In a small bowl combine all the seeds and set aside. Sift the flours, baking soda, and salt into a large mixing bowl. Stir in all but 2 tablespoons of the seeds. Make a well in the flour, pour in the buttermilk, and stir until the dough just comes together. If you need to add an extra splash of buttermilk because the dough is too dry, you can. As Hugh says, "Tip the dough out onto a lightly floured work surface and knead lightly for about a minute, just long enough to pull it together into a loose ball but no longer - you need to get it into the oven while the baking soda is still doing its stuff." Place the dough on a lightly floured baking sheet and mark it with a deep cross across the top, cutting two-thirds of the way through the loaf with a serrated knife. 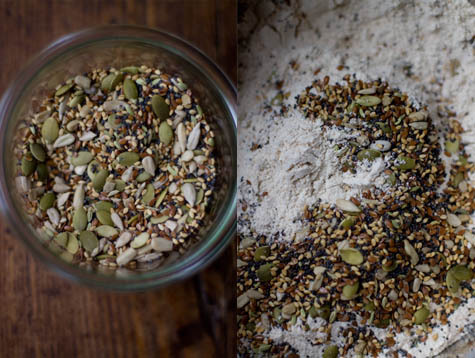 Brush with buttermilk and sprinkle with the remaining seeds, making sure plenty of seeds make it down into the cracks. Bake for 35 - 40 minutes, or until the bread is golden crusted on top and bottom (you may want to move the oven rack up for the last 15 minute if you need more color on the top of the loaf). Cool on a wire rack. Adapted from River Cottage everyday by Hugh Fearnley-Whittingstall, published by Bloomsbury.